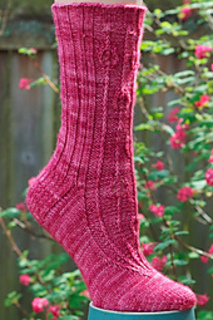 Rhodora was designed as the surprise pattern included with the April 2011 Hazel Knits sock club shipment. According to Ralph Waldo Emerson, “beauty is its own excuse for being.” But the beauty of Rhodora is an excuse for knitting! 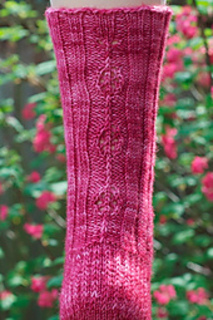 Eyelet blossoms grow out of a stockinette foot while gentle ribbing along the back of the leg ensures a good fit. Knit from the toe up/top down, Rhodora’s long and slender good looks will entice your eyes and your fingers to bring some more beauty into the world! If symmetry is more your thing, the front pattern can be repeated on the back instead of the ribbing; though this will give the sock less stretch. That first slipped st is to be slipped over to the instep sts and not worked as part of the heel flap. The heel flap is worked over the 31 purled sts; this was a bit unclear in the kit version of the pattern. The pattern will be available for sale during late summer of 2011.